When did your child start teething? Lucky for me (NOT! ), my son acted like he was teething starting at month 3 but didn't actually get his teeth until he was 9 months old! It was nice not getting them until he was a little older...however, that also meant he got 4 teeth within weeks of each other and it was really not fun for Mommy or my son! I think I am still a little traumatized from those months and I am DEFINITELY not looking forward to teething time with my daughter! As you know, I don't give my children most mainstream medicines or foods. I am really particular about what goes in their bodies and on their skins. If it isn't natural and/or organic, it probably isn't in my house. Therefore, when teething time and sickness come around, I don't give my children anything that isn't natural including products with Benzocaine, artificial dyes and colors, alcohol and sugars...which eliminates most drugs and medicines sold in stores and given by doctors! It can be hard but I have a couple of natural and homeopathic companies I really trust when these tough times come around to help heal and soothe my children. One of my favorite brands for teething time is Hyland's! When my son started teething about 2 years ago, I called up my mom begging her for a solution for teething pain so I could help my son! She recommended teething tablets. They don't numb (she tried numbing products one time on herself and found it was terrible and vowed she would never give that to her children!) but work naturally with the body to soothe and take away pain! 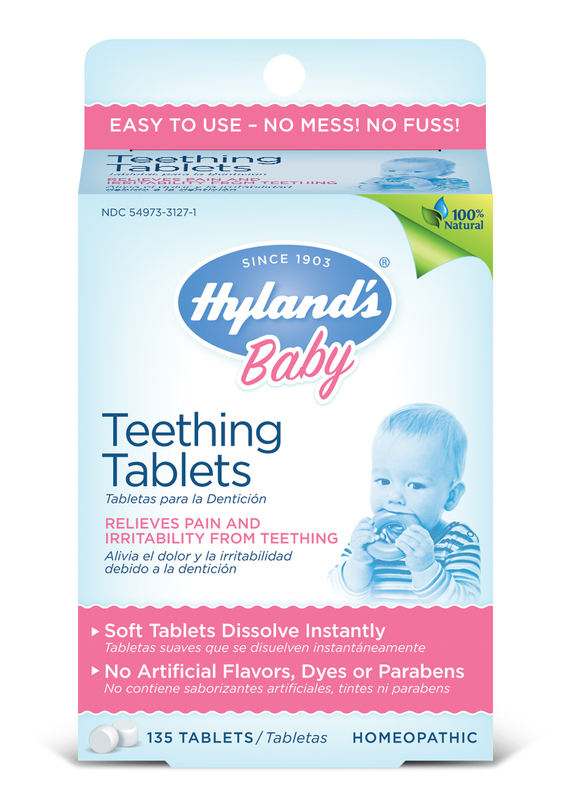 I immediately headed to the store and found Hyland's Homeopathic Teething Tablets and have never looked back! They were so soothing to my son during those rough teething months and I recommend them to every mother who is searching for teething pain solution for their child! I have always heard great feedback and a lot of genuine thanks for my suggestion! I also feel great when I give Hyland's products to my children because they develop homeopathic formulas with the highest quality natural ingredients following the strictest standards for preparation. With a century of commitment to homeopathy, Hyland's tradition of excellence consistently provides quality and integrity in every homeopathic product. I am so excited to see, and now own, Hyland's homeopathic Cough Syrup and other cold/cough and allergy products for babies and toddlers. My son suffers from some seasonal allergies and Hyland's Sniffles 'n Sneezes 4Kids and the Hyland's Allergy Relief 4Kids works wonders for my son! 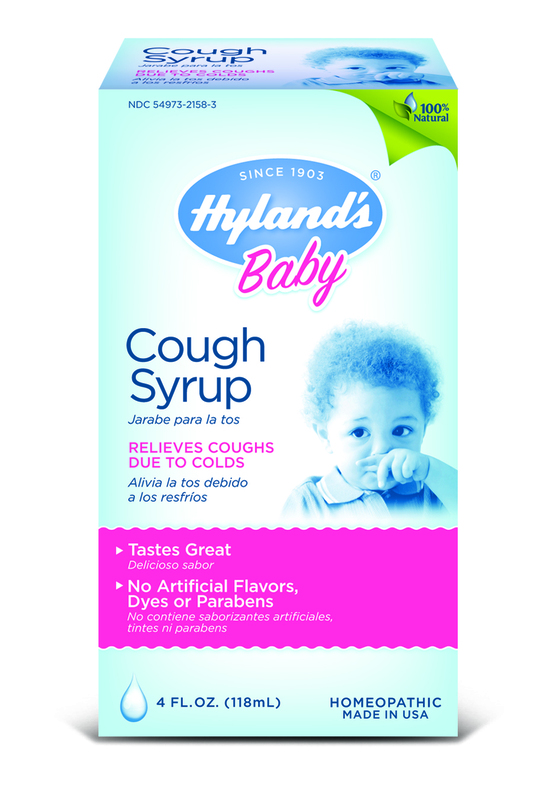 Some of my other favorite products from Hyland's is the Cough Syrup, Tiny Cold Tablets, Vitamin C Tablets, and Infant Earache Drops for babies! What a great range of products - and all safe and free from harmful ingredients that are in most mainstream products! Buy It: You can purchase all Hyland's products from local retailers including Walgreens, CVS, and Target! Win It: Hyland's is generously offering (1) Basket of Hyland's Products (includes Hyland's Sniffles 'n Sneezes 4Kids, Hyland's Allergy Relief 4Kids, Cough Syrup, Tiny Cold Tablets, Vitamin C Tablets, and Infant Earache Drops, and Teething Tablets) to a lucky winner!